This second guide in the 'Gardening with Nature Series' gives step by step advice on how to encourage butterflies to your garden. Jenny Steel describes the importance of providing shelter and avoiding the use of pesticides, with lists of suitable nectar and larval plants, and their maintenance. Actively encouraging butterflies to live in our gardens by providing them with nectar plants is now an objective for a great many gardeners. In the past the idea of welcoming these insects into the garden might have seemed rather strange, especially to those who managed their gardens in a more traditional way. Why are native plants important to butterflies? Our native wildflowers, trees, shrubs and climbers are of great importance to our native wildlife. These in general are the plants upon which our wild creatures depend for food – a relationship that has built up over many thousands, perhaps millions, of years. It therefore stands to reason that the more native plants you have in your garden, the more wildlife you will attract. To create the best sort of wildlife friendly native hedge make sure it is as wide as possible by planting two adjacent rows of shrubs. Planting two staggered rows will create a very dense and thick habitat which means it will provide a great deal of shelter and protection from the wind, but of course also means it will take up more space in your garden. If you are short of space a single row will suffice and still make an excellent wildlife habitat. In recent years garden centres and plant nurseries have taken on board the desire of many gardeners to attract wildlife to their gardens. 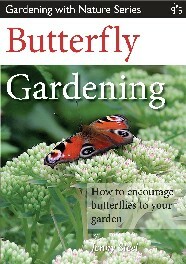 Gardening for butterflies in particular is no longer the strange practice of a few obsessed individuals! It is now a perfectly normal way of managing one’s garden. A garden alive with a variety of birds, bees and butterflies is an aim for many gardeners and this has resulted in the labelling of some species and varieties of plants in garden centres as ‘butterfly plants’ or ‘good for pollinators’. The maintenance of these plants is crucial. There is obviously no point in growing them only to snip off the vital bits when the eggs have been laid, the caterpillars are feeding on them, or the pupae are attached to the leaves or stems, and generally you won’t be able to find eggs, larvae or pupae because they are very well camouflaged. We are unlikely to see a caterpillar or pupa outside during the winter months – they are usually tucked away safely and are difficult to find. As long as the garden is not over tidied, they will be safe and can be left to themselves.